Every day around the same time, Kathy Hollinger, a successful and remarkably productive executive, closes her office door for half an hour. Co-workers assumed she was trying to get work done until a friend looked through the sliver of glass in her door one day and saw that she appeared to be doing nothing more than staring off into space. It seemed curious enough that the friend began to pass by periodically when her door was closed to see what she was doing. Like clockwork, she closed her door once a day and appeared to engage in… nothing at all. Eventually the friend asked Hollinger about the practice. She laughed and said one of the secrets to her incredible productivity was the time she took every day to just… be. For both Breyer and Hollinger, the small chunk of time they carve out each day to “just be” helps them cope with stress at work. They both say the daily stillness leaves them more focused, productive and better equipped to deal with unexpected changes. Hollinger also says that, many times, the deliberate pause helps get her creative juices flowing. Today’s technological advancements are both a blessing and a curse. You can order a pair of sandals with the click of a button, and they can be at your doorstep 48 hours later—amazing, right? But you can also become addicted to your devices and overwhelmed by the endless pings of emails, texts and social media notifications. Sometimes we equate being active with being productive. But replying to annoying emails, answering old texts and calling our spouses about what’s for dinner can both stress us out and stifle our potential for creativity and growth. Contrary to the popular belief that stress is the worst thing out there, a “stressor” itself can actually be a neutral or even positive event—it’s anything that knocks you out of balance, like a job offer, a loud noise or a first kiss. Stress falls into a spectrum: from good, to tolerable, to toxic. Stress becomes dangerous when your body is constantly coping with it and there’s no relief in sight. The stress caused by distraction is similar to what happens when your kids run around as you try to cook dinner or send an important email. Distractions limit your ability to focus and process information, which in turn lowers the quality of your work. And the type of stress caused by distraction is chronic—it’s always looming just below the surface. “I felt like my brain was becoming polluted by so many things, both physical and digital, that I couldn’t get much work done,” Mikael Cho, founder of the website Crew, says of his time as a project manager at a design agency. “I began the morning fresh, but as the day wore on, my anxiety levels would spike.” Cho says he felt a kind of sensory overload that prevented him from flexing his creative muscles. Believe it or not, the stress caused by constant distractions can also be addictive—just think of the words adrenaline rush. There is a comforting sense of certainty to endless to-do lists and nonstop activity because we despise the discomfort we feel when we’re uncertain. Many times we’ll go out of our way to make decisions just because we hate the feeling of not knowing. “Why is the most dangerous word in history,” says neuroscientist Beau Lotto, because it opens up the possibility of change and represents a potentially terrifying journey into the unknown. Yet it is exactly in those wide open, uncertain spaces that innovators often find brilliant solutions to problems. Research suggests there are healthier ways to stress—ones that won’t place such a burden on your well-being. The single most important thing you need to determine is how much stress is too much for you. Sustainable stress means that, in your daily life, there is a healthy balance between short spurts of high stress and periods with little to no stress. Think of beneficial stress as the high-octane turbocharge that powers you through a career-making presentation or propels you through a particularly difficult series of negotiations. Otherwise known as acute stress, it can enhance your focus, memory, concentration and learning. It can also boost your brain’s plasticity. But you can’t just take advantage of the benefits of acute stress—that’s only half of the equation. After all, stressing sustainably means that what goes up must also come down. And this is why the deliberate pause practiced by successful people like Breyer and Hollinger is the other half of the equation. Experts say we should all have a sacred space to “just be.” This may explain why practices such as meditation and yoga have exploded in the West. But a sacred space doesn’t have to be a hot, sticky yoga studio—it can be your car, a park bench or even the empty conference room at work. 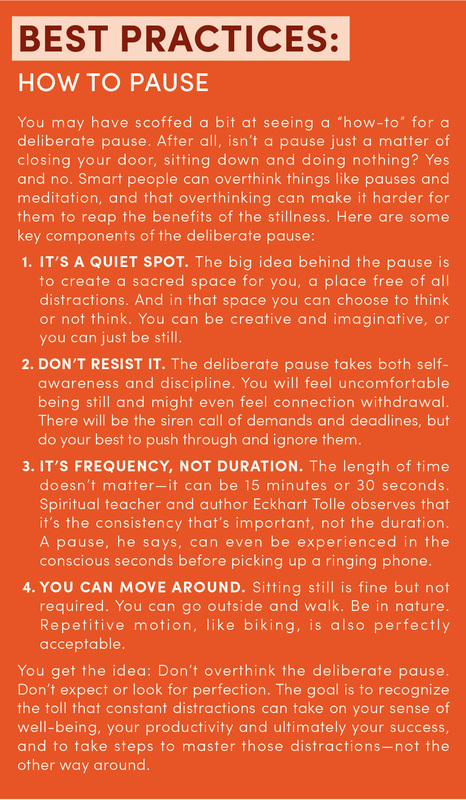 Now it’s your turn to master the deliberate pause. Shut the door, put your devices away and just be. Amanda Enayati is an author, columnist and communications strategist, whose essays about stress and happiness, health and technology, and creativity, design and innovation have appeared widely, including in SUCCESS, CNN, PBS, NPR, Washington Post, Reader's Digest, Salon and elsewhere. Her most recent book, Seeking Serenity: The 10 New Rules for Health and Happiness in the Age of Anxiety, was released by New American Library/Penguin Random House in 2015. Amanda consults and speaks for a diverse range of clients, including hospitals and medical centers, corporations, including B corps, foundations, international development agencies and universities. She began her career as an international corporate attorney and consultant for several large law firms, the World Bank and the U.S. Agency for International Development. Amanda’s writing has been used in several university textbooks on communication and writing, and her essays have been incorporated into curricula at Stanford, University of California at Berkeley, University of Texas, Dallas, and elsewhere. She has been featured as a speaker at SXSW, Stanford Medicine X, The Literacy Project, Aspen Writers, among others. Born in Tehran, Amanda fled the Iranian revolution as a child refugee and lived in several countries in Europe before settling in the United States in the mid-1980s.